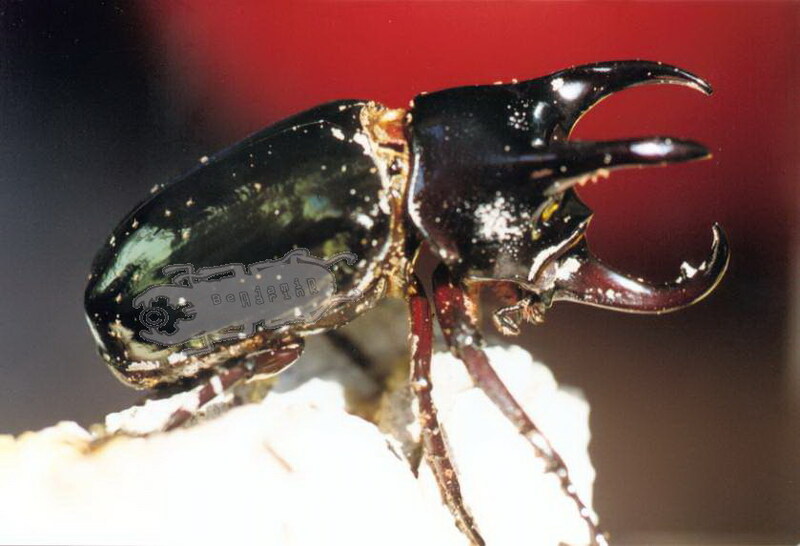 This report is based on my experiences according Chalcosoma caucasus in my own breed. I made some mistakes that would have been easy to avoid and that made breeding this species more difficult than it is… I am going to refer to it later on. 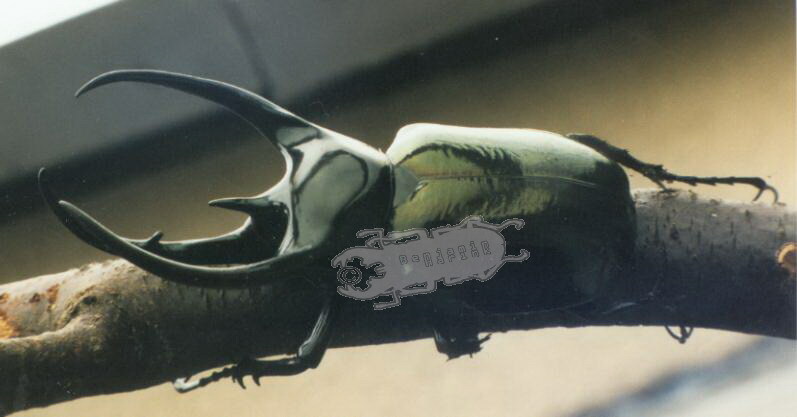 To begin: I started breeding Chalcosoma caucasus on 12.06.99. My stock was wild caught and I had one male and 3 females (1,3). I had prepared a box for them, the sizes of which were 40x 40 x 80 cm (length x width x height). It was filled at a level of 40 cm. The substrate I used was white rotten wood (mainly oak (Quercus ssp) and Beech (Fagus ssp. ? )), rotten leaves and normal potting ground in a mixture of 2: 2: 1. Before using it I put it in my oven and heated it up at about 180 degree Celsius for about 30 minutes in order to kill mites and other nuisances. (Now I know that the method of disinfecting the substrate usually leads to an overwhelming mass of mites…). The substrate was kept slightly wet and pressed very much in the bottom of the container (Thick, pressed substrate somehow leads to a greater number of eggs). The temperature ranged between 23 and 30 degree Celsius (night/day). The first eggs were seen on the 29.06.99 (2 eggs). On the 22.07.99 the male and on the 23.07.99 the last female died. In a whole, they laid 23 eggs 21 of which hatched. In the whole breeding time only 3 L3 larvae died due to disturbance by the adults. From now on, I kept them together in a 100 litre container, feeding them only beech and oak wood. Regarding the size of the beetles that hatched out of these larvae it surely was right. There was only one time I changed the substrate to late (two weeks or so), what caused a shrunken horn in the male, whereas their body size still was giant. Now to the first mistake I made: A breeder I know told me it would pose no problem to keep the larvae together: Of course, according to cannibalism there are no problems in this species, and one also doesn’t need as much space as one would need keeping them separated. BUT: When the first larvae are pupating, there are still some that want to be fed and any disturbance, for instance changing the substrate is to avoid, as it easily kills the pupae. Another problem is that in Chalcosoma caucasus, the males need a much longer time until they pupate, so it is highly recommended to separate males from females and keep the males warmer/ females cooler, in order to fasten/ slow down their development to have females and males at the same time. It is very depressing to see your females die old and a week later the males are hatching… This was my first problem. 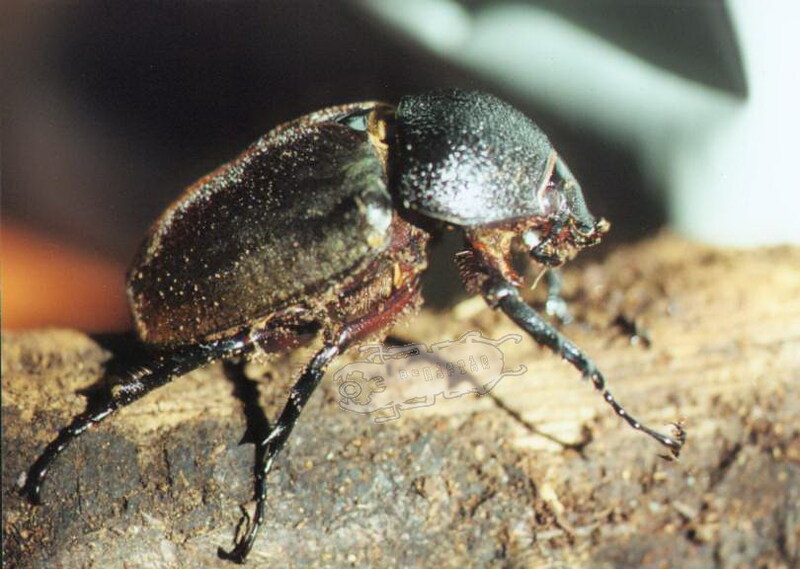 Another point in keeping them together is that the larvae disturb those that are pupating and a Chalcosoma larvae that is disturbed, is not likely to build up an other cocoon => the loss of larvae. Out of ten larvae that were kept together, I only managed to get out one male and two females. (The others died during their pupation). In addition to the problem of disturbing in pupation, there is the fact that the cocoon of this species is very delicate and not as hard as those of Cetonids… Another problem is the fact that some males are very aggressive and that it is very likely that they kill the females. I would propose to put them together only when you are near to interfere, otherwise you will lose the female. Hand pairing them could also be a possibility to avoid fighting. I was able to watch males fighting females only two times. As I was able to watch a number of males of different sizes and their behaviour, to me it seems, that real big and real small males don’t tend to be as aggressive as middle sized ones. But this only remains theory at the moment. The females hatched on the 12 and 14.11.00 (Duration of development from egg to imago 500 and 502 days), the male on the 27.03.01 (egg to imago 639 days). The male still is alive and is mating right now with the females of the breed of a friend of mine, as my females have already died, when the male hatched out. I hope this report helps breeding these species without making the mistakes I made. When paying attention to this report and avoiding mistakes, I think this species is easy to keep and breed and makes a good pet as it is pretty nice. I’m new to beetles and i wanted to try breeding stag beetles but so far i failed. Right now i just purchased a pair of chalcosoma atlas. Do they need rotten woods or do i just simply put them in the container with the substrate. And i also don’t know how to safely collect the eggs. it depends a bit on your set up. Normally you would need a certain substrate height (about 30cm or more for Chalcosoma), with the substrate being pressed together in the bottom 10cm. The substrat ideally consists of a mix of leaf compost and rotten wood, or to make things easier, and if you have access to it, flake soil. I would not try to collect the eggs, but wait until the larvae are hatched. Eggs are more sensitive and you might lose more, than waiting a few weeks after the female has deceased before you look for the larvae.